The measles outbreak linked to two Disney parks in California continues to grow and spread since first being reported earlier this week. Health officials in Orange County, California say they have seen eight confirmed cases of the contagious disease and expect it to spread. In addition, Washington State health authorities issued a measles advisory because a person with measles traveled to Sea-Tac Airport and visited several public areas in King and Snohomish counties while contagious. Public health officials say an out-of-state, unimmunized woman in her 20s became contagious with measles on December 28, 2014 after visiting Disneyland in southern CA in December. The visit was during a time when others who later got measles were at the park. The contagious traveler flew from Orange County, CA to Sea-Tac on December 29 and flew out of Sea-Tac airport on January 3 to return home. She stayed with family in Snohomish County. 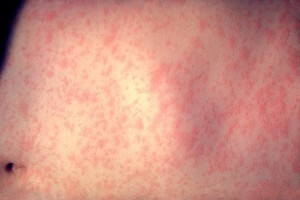 After returning home to California, the traveler got medical attention and was diagnosed with measles on January 8; she was infectious beginning on December 28. Health authorities in Washington and at the federal Centers for Disease Control and Prevention (CDC) were notified. The CDC is following-up to notify those on the same flights as the contagious traveler. In addition, the state Public Health Laboratories today confirmed a single measles case in Grays Harbor County in an unvaccinated woman in her teens. She also went to Disneyland when other confirmed cases were at the park. Health officials are working to contact people who may have been exposed at the health care facility she visited while contagious, Summit Pacific Medical Center in Elma.